The travel and tourism market demonstrates a steady year-over-year growth and is one of the fastest-growing sectors in the globe. Apart from that, the online travel market is developing fast too. 80% of last-minute reservations are made via mobiles. 45% of bookings for Online Travel Agency (OTA) fall on mobile devices. The conversion rates on mobile are 5x higher than on the mobile web. The stats above clearly indicate that mobile bookings are gradually becoming the ultimate way for users to book and pay for the stay. 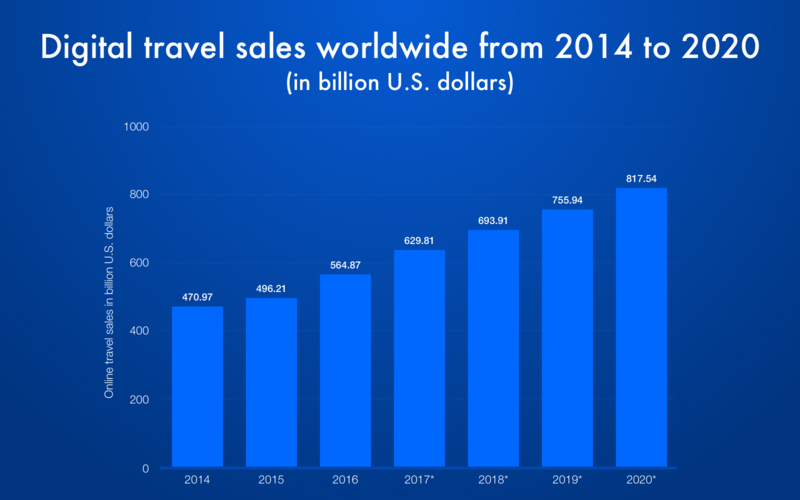 This tendency is also seen in digital travel sales that grow annually. Create a booking app is still a good idea for anyone thinking over this opportunity. The digital addiction of travel industry will only be continuing to grow with time. Since the demand is growing constantly, there is enough market space for healthy competition and you're at risk of losing a large slice of cake. The rating above is formed by SimilarWeb and based on the Travel category on the App Store. It only contains apps with the capability of booking a hotel or apartment for a stay. This rating is also drawn up by SimilarWeb and based on the Travel & Local category on the Google Play Store. Note: These rankings are dynamic, so they can change by the moment you read the article. Why did I list all those apps? The data-driven statistics will help you identify the main competitors and learn a lot from their apps. Correspondingly, the in-depth analysis can help you better understand your needs and objectives before proceeding with a hotel booking app design and further processes. Hotel aggregators. The primary focus of these apps is to aggregate hotel data and provide it to users. Booking.com, TripAdvisor, Hotels.com, etc. In case you're a tech entrepreneur or just an enthusiast with a fresh look on booking apps, you should probably choose between an OTA and booking aggregator. This is another important detail to settle before getting into the booking app development. Sure thing, it's always better to run the app worldwide rather than on a local market. However, it takes time and considerable financial investments to scale up to that level. You can save some time and money by starting with a local market. In addition, this approach can help you test the product and see how well it works. Conquering users is all about choosing the right positioning and value proposition. If you're wondering how to create a booking app and succeed in a certain niche, you have to determine the UVP. Last-minute booking deals. It's the most widespread value proposition model on the market that's offered by such companies as Booking.com, HotelTonight, Trivago, and others. Cheap booking options. Some travelers (especially millennials) don't really care where to spend the night after tiresome city walks. That's why cheap stays work best for them. This model is chosen by HostelWorld, HostelBookers, and some other companies targeted at low-cost travelers. Apartment rental / Room sharing. The room sharing business model was adopted by Airbnb and this is what made this service popular. Apart from that, the company is focused on short-term apartment rental. Both these models are fresh and in demand. Free stays. Such service as Couchsurfing.com allows users staying in each other's apartments for free. Figures speak for themselves: Couchsurfing.com is used by 12 million travelers from all over the globe. Short stays. This is a niche model for people who need to stay somewhere for no longer than one night. Dayuse.com company offers its users one-day booking at a lower price. Data is vital for hotel booking apps. I’m talking about hotel listings where users will be able to pick the one they'd like to book a stay in. Nobody wants to use an app for booking hotels without a single option in it. So it’s extremely important to think over where to get all that data. For example, Booking.com and many other hotel aggregators conclude an agreement with hotels. They install the software of their development at hotels to monitor availability and other parameters. That’s how major aggregators get and maintain a constant flow of new booking options. The drawback is that almost every available API has their own conditions of providing access to their database. It can be a considerable fee for listings, affiliate program, and many other points that might not suit to every project type. Every mobile and web application requires it to be managed smoothly. Admin panel is an integral part of any hotel booking app: from chain hotel applications to aggregators and OTAs. It’s not possible to manage listings and keep track of important data without having a well-thought-out, custom solution tailored to the platform’s peculiarities and needs. To build a successful hotel booking application, it’s necessary to consider not only the costs of user-facing part of product but expenses on infrastructure like admin panel and other related solutions. Step 1. Make analysis of online travel market. Step 2. Choose a type of your hotel booking app. Step 3. Create a list of competitors of your hotel booking app. Step 4. Decide on the app distribution area. Step 5. Define your Unique Value Proposition. Step 6. Make a list of app's features for MVP. Step 7. Consider additional features for the app. Step 8. Find and hire a software development company with expertise at hospitality or form an in-house team. Step 9. Tell about your business objectives and expectations. Step 10. Be involved in the app development process when it starts. Step 11. Make sure your employees or software development company delivers your vision correctly (take part in meetings for this). Step 12. Draw up and launch a marketing strategy if it's necessary. Step 13. Launch the hotel booking app on your target markets. Step 14. Collect feedbacks, scale, introduce new features. This is sort of a skeleton that was made up by our business analysts. It can be used in case you don't know where to start from and how to concentrate your efforts. This is one of the basic features that almost any app needs. The important detail here is to let users utilize the core functionality of your hotel booking app in a guest mode without registering. Otherwise, the conversion rates can be lower than expected. Another important detail to create a user-friendly booking app is to provide several registration options (e.g. email/password + social media account). This step can help you double the user base. Email/password method is relatively time-consuming and a part of your users may abandon registration. The main purpose of any booking app is to let their users find a place for a stay with ease. That's why booking app development demands a well-thought-out booking screen. Don't overload it with unnecessary details and make sure it has appropriate fields for all the important data. It's also a good idea to integrate the location tracking feature. It's especially suitable for last-minute bookings. A simple 'Near me' button on the booking screen could make the user experience much better. Here is a concept of flight booking our UI/UX designers have created. Its booking parameters are pretty similar to the ones for hotel booking apps. How to make a booking app and not to fail? Assign the task of working out a robust in-app search engine for your app development team. A well-engineered and thought search is a cornerstone of good user experience for every booking app. Let's dive deeper into details. Filters have already become a common feature for every search-related functionality. 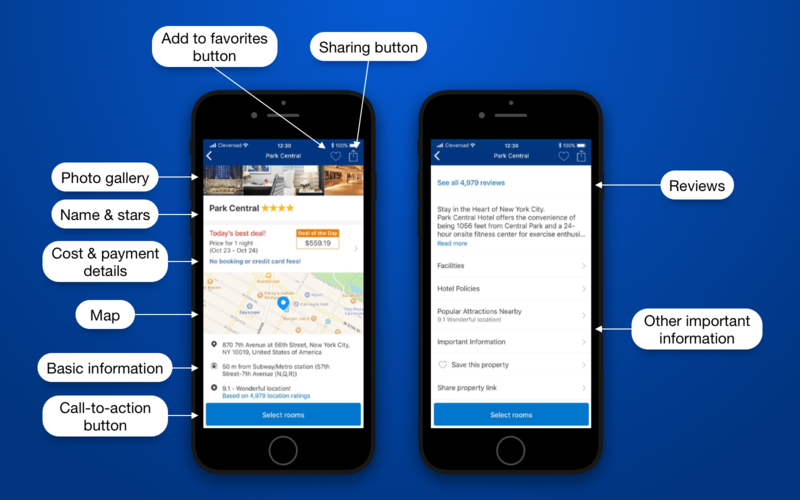 To build a competitive hotel booking app, you have to make your in-app search as flexible as possible. Filters are a perfect fit for this. The right approach to visualizing search results can help you conquer more loyal users. For instance, showing available accommodations on a map is considered to be a good practice as it allows users making more informed decisions. 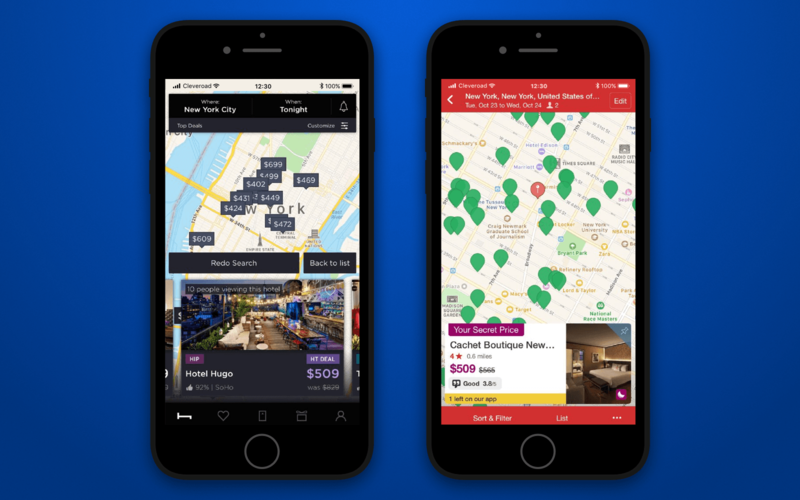 HotelTonight has added the map to their main screen to build better experience and visualization. 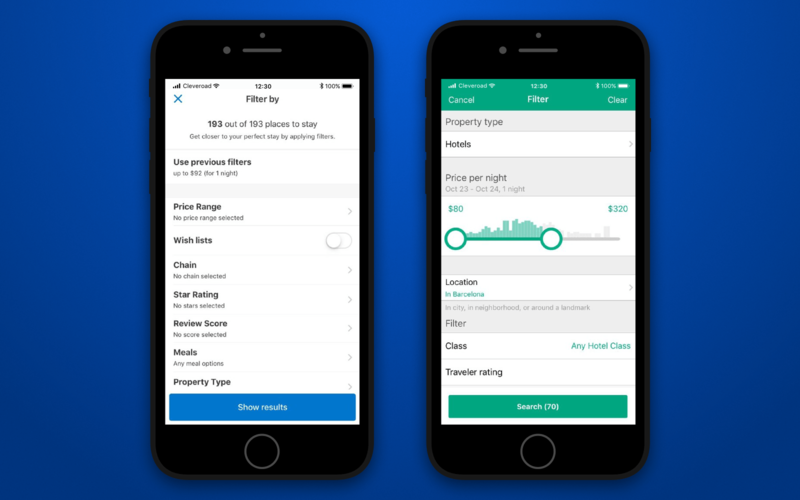 It's logical that after users have entered all the booking details, got search results and applied filters to them, they will probably want to take a closer look at chosen accommodations. These are some of the basic information most travelers would like to be aware of before booking the stay. It's important because the more details you show, the more chances that users will finalize their decision and book the stay via your app. And don't forget about confirmation details. Create a screen where users could see all the necessary information regarding the stay. In addition, you can place some CTA buttons in there to increase conversion rates. 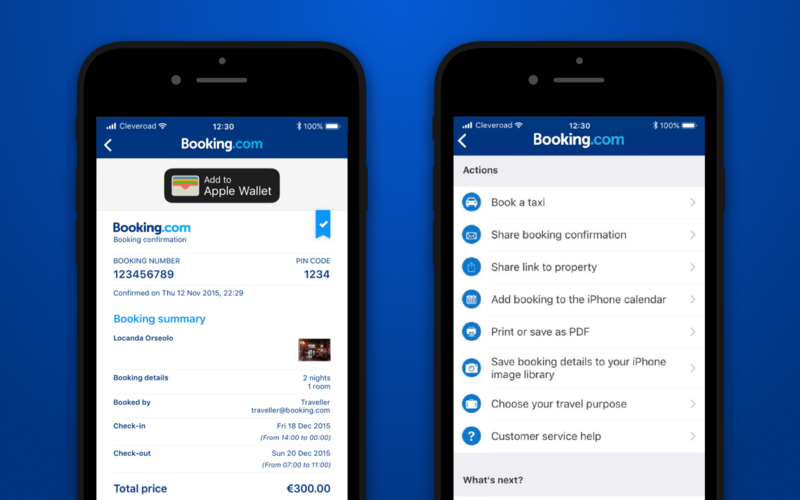 For example, Booking.com offers users to book a taxi, contact property, and many other options on this screen. You either have it or you don't. However, bear in mind that users want to feel themselves protected and appreciate the opportunity to cancel their booking in a case of emergency. Study cancellation policies of the top booking apps mentioned above in the tables at the beginning of our journey. Such a small research can help you better understand what steps you should take. Just for the record, Booking.com and Airbnb both have a pretty flexible cancellation policy. Hotel booking app development isn't only about basic functionality. Your product must be packed with features that would be an icing on the cake for users. Not necessarily must you add all of them into the app's release version. You can do it through some time after the launch when you'll have a feedback from users and a solid understanding of what direction should you move. There are several ideas you can make use of and adapt to your vision. In case you decided that your app needs registration, it wouldn't hurt to create user profiles where the information about all the past and incoming bookings will be held along with other important data. Suggestions are always a good booster for conversion. Especially the ones based on user search queries and personalized for their objectives. However, suggestion algorithms are pretty hard to build and so this feature requires considerable financial investments and a lot of time to be built. To create a booking app that's commercially successful, you're going to think through dozens of details like these. Price changes or lack of accommodations due to seasonal demands, holiday or whatever is a great motivator for the user to book a hotel right away which undoubtedly influences your earning. All you have to do is to inform users about a peak demand, say prices that will go through the roof, and offer to book accommodation beforehand. Underneath you can see how Airbnb informs their users about possible difficulties in booking an apartment for the set date. They don't only generate more profit in this way but care about their customers too. These two small details provide a way better personalization and enhance the overall user experience of your app. That's why it makes sense to add them after the main part of hotel booking app development is completed. 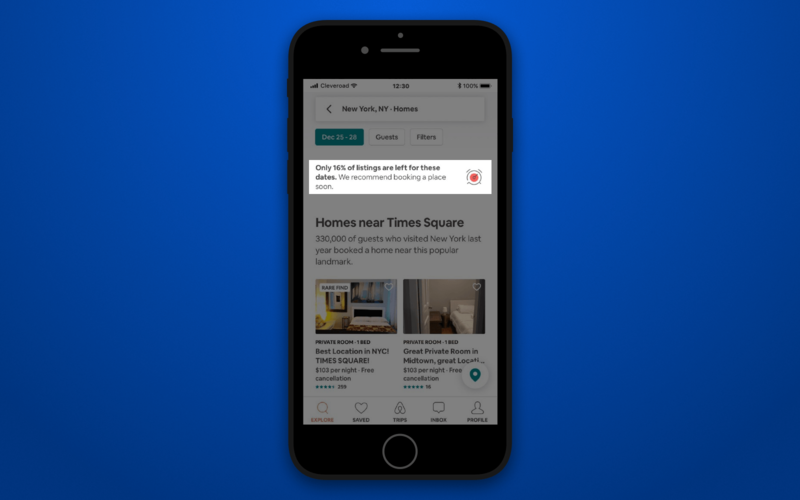 Such players as Booking.com and Airbnb have already implemented built-in instant messaging opportunity in their apps, though their strategies vary a bit. While Airbnb has a familiar messenger, Booking.com has chosen a path of semi-robotized chat. 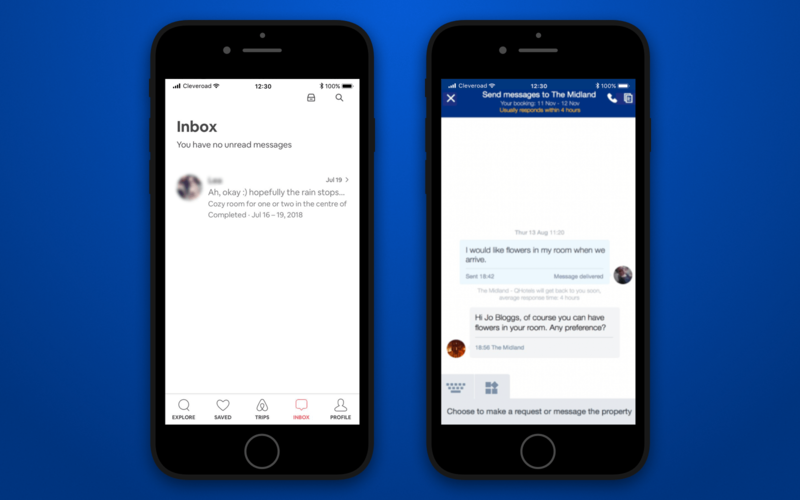 They have built a sort of chatbot that answers FAQs and in case that's not enough -- users can contact property representatives by messaging them. Appropriate and personalized push notifications is another way to earn more and bring better user experience at the same time. Check-in / check-out alerts. Remind users that it's time to check-in or out of the accommodation. You may not believe it, but such a notification can be really helpful. Interesting places and activities nearby. Become more than just a booking app for your users. Tell them what they can do in the city of their stay and send them notifications when they pass by interesting places. Special deals, offers, discounts. You certainly should use push notifications to inform users about upcoming deals that can be of interest for them. Weather info. Another useful application for push notifications. So, you are aware of how to make a booking app of your own and what features to add. It's time to look into the future and determining the most suitable monetization strategy. Service fee. You can charge a fee for every booking made via your application. Airbnb charges commision from users while Booking.com charges it from hotels and apartments that were booked by users. Subscription. You can offer users to purchase a subscription if they want to get access to more interesting deals and discounts in the future. It's also applicable for premium functionality. Advertising. Let hotels pay for advertising within your platform to be ranked first in the search results by a certain query (e.g. city or region). Marketplace. Charge fees from hotels that want to be listed on your platform. It can be a one-time payment or subscription. It's not the ultimate list. You can adopt any other known monetization strategy for your product and make use of it. Let's now consider the time and cost you need to create a hotel booking app. Note: The calculations below are approximate (rough). The functionality might vary from the one described in this article due to technical peculiarities. These estimations are crafted only for acquaintance and shouldn't be treated as the final price of the project. To learn an approximate price in dollar equivalent -- multiply those numbers by an hourly rate of your in-house developers or software development company you work with. Don't forget that any mobile app also needs a web-based admin panel to manage it and UI/UX design. Let's sum up all the expenses taking our company's hourly rate ($50/h) as an example. The creation of a hotel booking app is a laborious process that demands the participation of dedicated specialists. Our engineering team already has a solid expertise in building travel and hospitality software. Drop us a line to tell more about your project, ask your questions, and get a custom estimation of your hotel booking app idea. Before you go, you can subscribe to our newsletter to stay tuned with our updates and watch the video dedicated to the importance of MVP for business.